1 Line a 27 x 17 x 3.5 cm (101/2 x 61/2 x 11/2 inch) baking tin with baking parchment and oil lightly. Preheat the oven to 180C (350F), Gas Mark 4. 2 Place 2 heaped tablespoons of the flour in a saucepan and mix in the rice milk. Cook, stirring constantly, over a medium heat until thick. Set aside to cool completely. 3 Combine the soya milk, oil, cocoa and carob in a bowl and stir until smooth. 4 Transfer the cooled flour mixture to a food processer or liquidizer, add the sugar, salt, vanilla, prunes and dates, and blend until smooth. Add the cocoa mixture and blend again. 5 Mix the remaining flour with the baking powder and the ground almonds, then add to the prune mixture and blend again. 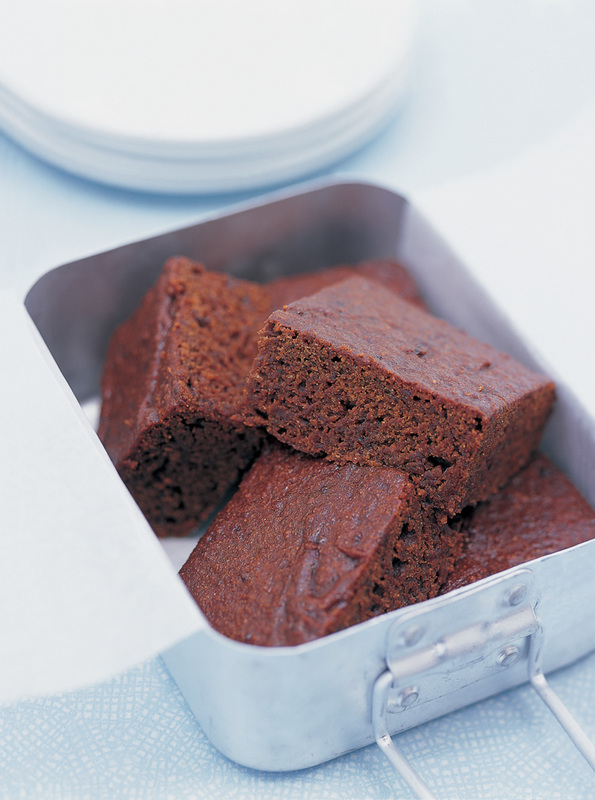 Pour the mixture into the prepared tin and bake for 2535 minutes, until firm to the touch. 6 Cut into slices and serve hot with a scoop of vegan ice cream and some grated chocolate.